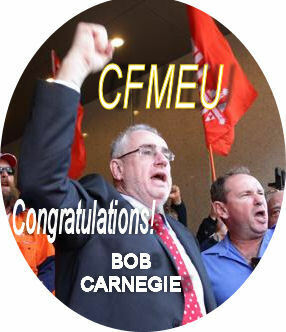 The charges arose as a result of Bob Carnegie attempting to enforce a picket line at the Children's Hospital then under construction in Brisbane against an attempt by the anti-union employer AbiGroup to deny union rights to workers working there. This is a monumental win for Australian trade unions, whose rights have been eroded since former Liberal Prime Minister Malcolm Fraser criminalised much trade union activity with his Sections 45D and 45E of the Trade Practises Act. Under the legislation, it became a criminal offence for workers to take industrial action against an employer other than their own. So, action by workers in one workplace in solidarity with another work place was forbidden. Incidentally, Malcolm Fraser, in recent years, has made great efforts to have himself depicted in the media as a "bleeding heart" friend of refugees,1 2. Vietnamese refugees were also used to undermine trade union militancy, particularly in the Melboune Postal exchange, where many were employed. The 'Labor' Governments of Bob Hawke and Paul Keating, which ruled Australia from 1983 until 1996 and began the transformation of Australia into a neoliberal "free market" economy, chose not to repeal these laws. As a result, Liberal Prime Minister John Howard attempted to break the Maritime Union of Australia (MUA) in 1998 having little fear that other unions would give effective industrial support to the MUA. Fortunately, a determined campaign by the Australian community, including the families of seafarers and wharfies, defeated Howard's attempt to break the union. It was also helped by a the New Zealand Seafarers' Union refusing to work on on a ship which had been loaded by scab labour. Sadly, as recorded in The Latham Diaries (2005) collaboration by unconscionable Labor politicians, including the current Australian foreign Minister Bob Carr, enabled John Howard to rort his way back into office in 1998, 2001 an 2004. The fight isn’t entirely over, as Bob still faces a civil case brought against him by Abigroup, but today’s news is a huge victory. We’ll post more news and reaction later, but for now, a huge thank you to all our supporters across the world who’ve helped keep up the pressure and maintain the profile of the campaign. 1 ↑ As an example, see Malcolm Fraser on Coalition asylum plans: no limits to the inhumanity in the Guardian of 16 Aug 2013. 2 ↑ One example is refugees from Vietnam. Prior to 1975, these Vietnamese refugees had sided with occupying Australian and American military forces in the war against their own people (and, before that, the French colonists and Japanese occupiers). During the war, much of the country was destroyed as bombs with the explosive capacity equivalent to 640 Hiroshima-sized atomic bombs were dropped on Vietnam (in addition what was dropped on neighbouring Laos and Cambodia) and much of the Vietnamese jungle was destroyed with "Agent Orange" defoliant sprayed from above. Nick Turse, author of Kill Anything That Moves: The Real American War in Vietnam (1913) estimates that 2.3 million Vietnamese civilians died in the war and 5.3 million were wounded. After the 'South' Vietnamese American puppet regime of was defeated in 1975, many of those who had supported it fled to Australia as refugees. Here they were welcomed with open arms by the then Prime Minister Malcolm Fraser. As Minister for the Army after 1966 and as Minister for Defence from 1969 until 1971, he had conscripted Australians into the Army and sent them to fight in defence of the South Vietnamese dictatorship. After the refugees arrived, they formed an electoral bloc of support for Malcolm Fraser. With their help, he was able to stay in office until 1983. 3 ↑ This is described in Mark Latham's political gift to John Howard of 20 Nov 2007 by James Sinnamon. Sadly, Latham acted no better in 2007 than those of which he was rightly critical in The Latham Diaries. He actually opposed the trade union movement's "Your Rights at Work" campaign against "Work Choices" and called on Australians to vote for John Howard. The CFMEU have been critical of government immigration policies, and the erosion of the right to jobs for Australians - jobs created by our economy that should go to Australians. CFMEU have exposed the fact that more than than 191,000 people on the 457 temporary work (skilled) visas were here as of June 30, a jump of 18 per cent since last year. There was also a similar rise in the number of people on working holiday visas to 160,500 over the same period, according to new Immigration Department data. CFMEU construction division national secretary Dave Noonan said: "Clearly, there's a significant number of employers that are more focused on getting overseas temporary labour in place rather than offering jobs and apprenticeship opportunities to young Australians." Why would a "Labor" government destroy the job opportunities for Australians at a time of rising unemployment, and austere conditions? They have betrayed their traditional values for the benefit of big businesses who want cheap, compliant and flexible foreign labour - many of whom will apply for Permanent Residence. While the "immigration" debate rests on asylum seekers, the foreign invasion that people see as a growing problem, legal immigration keeps increasing and goes largely unnoticed. At least the CFMEU, a union that our government would rather not exist, are exposing the immigration rorts. The latest figures show that there were 1.66 million temporary entrants in Australia on June 30, compared with 1.63 million a year ago. This includes 640,000 New Zealanders on special temporary visas, 304,000 overseas students and 200,000 overseas visitors. So, it seems my ridicule of Malcolm Fraser's "efforts to have himself depicted in the media as a 'bleeding heart' friend of refugees" was unfair. Other concerns about his political record still remain. These include his role in the 1975 CIA coup against the government of Gough Whitlam in 1975 and his Sections 45D and 45E of the Trade Practices Act which have criminalised "secondary boycotts" or industrial action by one group of workers in support of another group of workers.In spite of theses concerns, Malcolm Fraser has demonstrated, by his support of Syria that he is prepared to use his public profile to oppose war and defend humanitarian values. You forgot to mention also that Fraser started the appalling dismantling of our laws that protected Australian interests from foreign takeover and Australian housing from foreign purchase. I have never been impressed by Fraser's stance on refugees because of his lack of support for the citizens of his own country, (which appeared at the time as contempt) whose disempowerment he has helped to orchestrate - "Life wasn't meant to be easy." I do not think that Fraser would approve of the Syrian government's defense of public assets and public banking. In my opinion, Fraser's charity is an arms length job that leap-frogs over Australians. The pursuit of 'human rights' over civil rights defeats human rights and local empowerment. Australia is particularly poor in civil rights. In Fraser's pursuit of charity at arm's length he is like so many of our 'modern' politicians and his attitude aligns with the increasingly distant and authoritarian structure of government here. I am afraid that his rehabilitation in recent years by the Fairfax and Murdoch Press inspires me with suspicion that his 'brand' is useful for ongoing undemocratic processes. "Australia's return to a populationist development and housing policy under the Fraser Government. immigration - and high energy consumption. investment rules, with the Foreign Takeovers Act (1975). after 1975. Between 1980 and 1981 there was the "highest capital inflow on record." recession affected the housing industry. in a syndicate to finance Bond's America's Cup venture. increased, with strong encouragement from the Australian Treasury. consolidate its population and energy use to the absence of such a lobby. development lobby in driving immigration is strong. absence of an immmigration dependent property industry."